I would like to see the recipe for this and instructions! Hi Dale – Hook: TMC 200R I think this one was a size 12; quantity 2 – 1/8″ diameter gold beads, Black turkey or goose biots – Ribbing- gold wire – I think this was Small or X-Small; Abdomen: Black Borden’s Hare-tron dubbing; Wingcases: Black quill sprayed with Krylon Acrylic; Legs: webby hen hackle; Thorax: more Black Borden’s Hare-tron; Antenna: 2 goose or turkey biots. After slipping the beads on I attach the thread in front of the beads and attach the antenna biots. I believe I put a little dubbing just behind the antennas and tied off. Slip both beads up and tie thread back in just behind the rear bead. Work thread to tail position. Dub a little ball of dubbing and tie it around the shank. I think I tied the wire in then before the tails if I am remembering correctly. It was either now or after the tail biots were tied in. After the wire and tails are tied in, then I dub the abdomen. The thread should be about mid shank after dubbing the abdomen. Then wrap wire ribbing up and tie off. Tie in the first wingcase and a webby hen hackle. Dub the thorax – I tried dubbing a little ‘fuller’ than the abdomen. Wrap the hackle several turns to your liking and tie off. I used a bodkin to make the fold in the wingcase and then lay it forward and tie it down. Tie in the second wingcase quill – this should be just behind the second bead. I try to cross the thread over the rear bead – over top of the bead as it sits on the hook to position the thread between the beads – OR – I could see tying off after the second wingcase is tied in and then reapplying the thread between the beads. Tie down the front wingcase. Dub a little between the beads and tie off. A couple of these steps my not be exactly as I did it. I don’t remember if I took notes when I tied these. If I did and find them I’ll amend these comments. Send me a picture if you try tying these and I’ll post it if you want! edit add: Looking at the second picture to the right I think I may have tied a second hackle between the beads too! 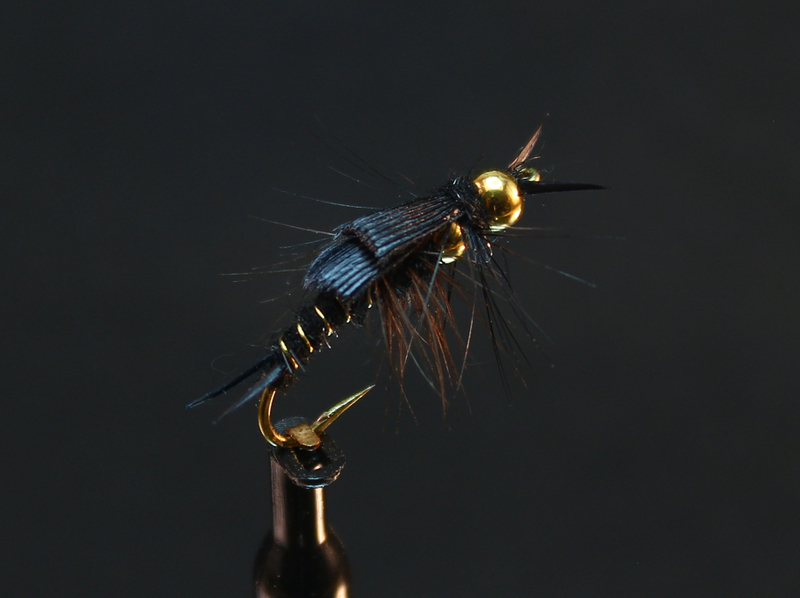 The pictured fly though has hackle which looks more like dry fly hackle and I prefer the look of a webby soft hackle tied with this fly (like the flies tied on the 2-22-18 entry).